I’m trying to finish off a paper that Tobias Fritz and I have been working on, which gives a category-theoretic (and Bayesian!) characterization of relative entropy. It’s a kind of sequel to our paper with Tom Leinster, in which we characterized entropy. That earlier paper was developed in conversations on the n-Category Café. It was a lot of fun; I sort of miss that style of working. Also, to get warmed up, I need to think through some things I’ve thought about before. So, I might as well write them down here. There are many categories related to probability theory, and they’re related in many ways. Last summer—on the 24th of August 2012, according to my notes here—Jamie Vicary, Brendan Fong and I worked through a bunch of these relationships. I need to write them down now, even if they’re not all vitally important to my paper with Tobias. They’re sort of buzzing around my brain like flies. People often do linear algebra over a field, which is—roughly speaking—a number system where you can add, subtract, multiply and divide. But algebraists have long realized that a lot of linear algebra still works with a commutative ring, where you can’t necessarily divide. It gets more complicated, but also a lot more interesting. But in fact, a lot still works with a commutative rig, where we can’t necessarily subtract either! Something I keep telling everyone is that linear algebra over rigs is a good idea for studying things like probability theory, thermodynamics, and the principle of least action. Today we’ll start with the rig of nonnegative real numbers with their usual addition and multiplication; let’s call this The idea is that measure theory, and probability theory, are closely related to linear algebra over this rig. Let be the category with of finitely generated free -modules as objects, and module homomorphisms as morphisms. I’ll call these morphisms maps. Puzzle. Do we need to say ‘free’ here? Are there finitely generated modules over that aren’t free? 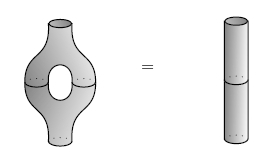 We can take tensor products of finitely generated free modules, and this makes into a symmetric monoidal †-category. This means we can draw maps using string diagrams in the usual way. However, I’m feeling lazy so I’ll often write equations when I could be drawing diagrams. One of the rules of the game is that all these equations will make sense in any symmetric monoidal †-category. So we could, if we wanted, generalize ideas from probability theory this way. If you want to do this, you’ll need to know that is the unit for the tensor product in We’ll be seeing this guy a lot. So if you want to generalize, replace by any symmetric monoidal †-category, and replace by the unit for the tensor product. • Bob Coecke, Dusko Pavlovic and Jamie Vicary, A new description of orthogonal bases. for some specified isomorphism in Furthermore, this is an isomorphism of special commutative †-Frobenius algebras! In case you’re wondering, these vectors correspond to the functions on that are zero everywhere except at one point where they equal 1. In short, a special commutative †-Frobenius algebra in is just a fancy way of talking about a finite set. This may seem silly, but it’s a way to start describing probability theory using linear algebra very much as we do with quantum theory. This analogy between quantum theory and probability theory is so interesting that it deserves a book. But what if preserves just the counit? This sounds like a dry, formal question. But it’s not: the answer is something useful, a ‘stochastic map’. says that if we take any -tuple of numbers, multiply it by the matrix and then sum up the entries of the resulting -tuple, it’s the same as if we summed up the original -tuple. But this says precisely that each column of the matrix sums to 1. So, we can use our formalism to describe the category with finite sets as objects and stochastic maps as morphisms. We’ve seen this category is equivalent to the category with special commutative †-Frobenius algebras in as objects and counit-preserving maps as morphisms. Puzzle. How can we describe this measure without the annoying use of counting measure? 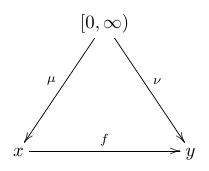 Conversely, any measure-preserving function between finite measure spaces obeys this equation. So, we get an algebraic way of describing the category with finite measure spaces as objects and measure-preserving maps as morphisms. is the counit for The equation simply says the total integral of our measure is 1. In this article I didn’t get anywhere near to talking about what Tobias and I were actually doing! But it was good to get this basic stuff written down. This entry was posted on Thursday, June 20th, 2013 at 3:36 am and is filed under information and entropy, probability. You can follow any responses to this entry through the RSS 2.0 feed. You can leave a response, or trackback from your own site. I usually use the rig for measure theory (with , so that it is a rig; see also nLab: lower real number#arithmetic for a constructive treatment that makes this happen automatically) rather than . This doesn’t really matter for probability measures, but normally one allows positive measures (even on finite measure spaces) to be infinite. Good point! I don’t feel a pressing need for here, but I think everything would work just as well with it… and when we get to relative entropy, we’ll see it really needs to take the value whenever you have a prior that assigns zero probability to an event that turns out to happen, leaving you ‘infinitely surprised’. I hadn’t thought that that use of could be extended to supplant the use of here, since I (implicitly) thought of entropy and probability as being different ‘types of thing’. But maybe using everywhere will make things nicer somehow. It’s great to see this written down! Typo: $\dagger $-category is missing the “latex”. There are other -modules which are not even embeddable into a vector space. The most notorious ones are semilattices with a bottom element, i.e. 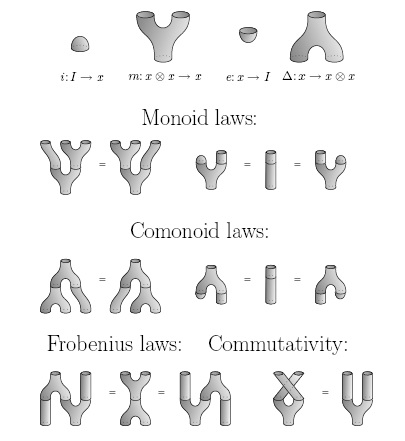 commutative idempotent monoids . Such a gadget becomes a -module if one takes multiplication by positive scalars to act trivially. Thanks! Are you trying to keep your identity secret? I’d like to let people know who you are. More later… thanks a lot for help on that first puzzle. The second puzzle I think I understand. The reason is that measures are covariant; we want to be able to take a measure and push it forward along and get a new measure on And in this approach. it’s easy: just compose them and get Note this works when is actually a function between finite sets, but also more generally when is a stochastic map or even more generally when it’s what I was calling a `map’, meaning any homomorphism of -modules. In short, measures are maps Functions are maps Measures and functions are dual, both in the sense that we can compose them and get numbers, and in the sense that we can ‘turn one around’ using the †-structure and get the other! As a space, this has to be 1-dimensional, as one can easily check, and the unique 1d free module is spanned by one element. Yet no one element of spans it. Isn’t this just the real line, considered as an -module? Your quotient sounds a lot like the construction of formally turning an abelian monoid into an abelian group by throwing in inverses. This can also be applied to -modules, in which case it turns every module into a vector space. So yes, the simplest non-free module is 1-dimensional, namely just the real line. D’oh! Hey, you’re right! I didn’t think of that because I wasn’t sure if the real line would be finitely generated, but of course it is! It’s generated by 1 and -1. And that’s how I thought of my example: two generators such that the sum is zero. Your second example is more interesting, though, because who ever thinks of as a -module? Actually what’s really going on here is that is the Boolean semiring (rig) with , which comes with a rig homomorphism . This is how the Boolean rig becomes a -module. More generally, the -modules are precisely the join-semilattices, hence all these become -modules via the above homomorphism. Sorry, I should have explained that the homomorphism is the map which sends to and every positive number to . You probably know this, but I should point out: if you think of as the rig that governs probability theory, then its quotient is the rig that governs possibility theory. Numbers in are relative probabilities. In , 0 means ‘impossible’ and 1 means ‘possible’. So, the quotient map sends nonzero probabilities to ‘possible’, and zero probability to ‘impossible’. So what’s really really going on is that is the rig of truth values under the operations OR and AND. This makes sense, since probability theory is generalized logic. is confusing to me. Is that quotient a quotient of sets, or of -modules? Since you’re trying to create a -module I’ll assume the latter. If so, you’re taking viewed as a free -module with two generators, and you’re creating a quotient -module in which all elements of the form are set equal to zero. In the first part of this mini-series, I described how various ideas important in probability theory arise naturally when you start doing linear algebra using only the nonnegative real numbers. But Tobias Fritz and I have proved a theorem characterizing the concept of relative entropy, which is also known as ‘relative information’, ‘information gain’ or—most terrifying and least helpful of all—’Kullback-Leibler divergence’. And in this second part, I’ll introduce two key players in this theorem.